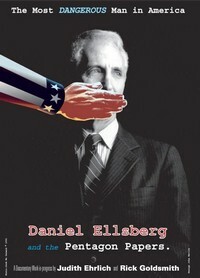 The Most Dangerous Man in America: Daniel Ellsberg and the Pentagon Papers is a 2009 documentary film directed by Judith Ehrlich and Rick Goldsmith. The film follows Daniel Ellsberg and explores the events leading up to the publication of the Pentagon Papers, which exposed the top-secret military history of the United States involvement in Vietnam. The film was shown on the PBS series POV in 2010, for which it earned a Peabody Award. ^ Hale, Mike (16 September 2009). "Most Dangerous Man in America: Daniel Ellsberg and the Pentagon Papers, The Untold Story of a War, and the Story of the Man Who Told It". New York Times. Retrieved 18 February 2010. This page was last edited on 8 December 2018, at 22:03 (UTC).